Summer learning loss is a real problem. Alarmingly, research suggests students lose more than two months of math knowledge during the summer, and the losses in reading are similar. Here we’ve compiled a few resources to keep students learning through the dog days of summer, with a particular focus on math and reading. For starters, the Edutopia blog How to Beat Summer Learning Loss from Anne O’Brien is chock full of useful information and strategies for parents and students. Summer Learning Resources for Parents From Colorín Colorado: This reading resource roundup for parents is awesome! The page features guides, tips, and reading lesson ideas in Spanish and English. Another great resource from sister site Reading Rockets is Get Ready for Summer! Ideas for Teachers to Share With Families. 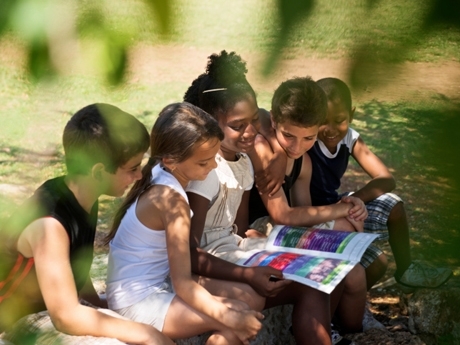 Cool Summer Reading and Learning for Middle School Kids: Author Susan Curtis highlights some of the most useful websites, ideas, and strategies for helping middle school students stay active readers during the summer. Included are links to reading lists, online reading contests, and ideas for practicing reading with tech tools. Also check out Awesome Apps for the Six Traits of Writing, from WeAreTeachers, for improving writing skills with apps during the summer. Calculation Nation From the NCTM: If you're looking for a fun, web-based game for students, Calculation Nation from the National Council of Teachers of Mathematics is a wonderful resource. This is just one example; there are tons of awesome games. Also check out Funbrain Math Arcade from Pearson, 10 Best Math Apps for Kids from Parents.com, and Cool Math. Summer Learning Resources for Parents From ReadWriteThink: This after-school and parent collection from ReadWriteThink offers something for everything. There are links to summer activities and projects, games and tech tools, printouts, and how-to articles. Plus, there's a link to a useful podcast series about out-of-school learning. Summer Learning Guide: Common Sense Media produced this resource with some really cool activities for students of all ages. You'll find links to apps for coding, building media projects, and creating art. Simple Tips for Summer Math Learning From PBS Parents: These easy-to-implement ideas are perfect for summer learning. My favorites: Turn chores into math learning opportunities, or find math lessons in your child’s collection (sea shells, baseball cards, etc.). PBS Parents’ reading tips guide is also extremely useful. 11 Everyday Math Activities for Summertime Fun: FamilyEducation.com highlights a few ways to teach math during the summer -- a lemonade stand is always a fun one -- but this post is just one of many in their trove of summer learning blogs for parents.